The Third Saturday in October has come and gone with yet another Alabama victory. This time, the Crimson Tide won 58-21, breaking the record for the most points ever scored in the rivalry. Although the loss may hurt, this is probably the best team Alabama has ever had, and they have done similar things to opponents all year. Despite the common perception that a loss like this may hurt the Vols in recruiting, it could actually help in the recruitment with several of their key targets still left uncommitted. Receive all of our in-depth analysis on Tennessee’s recruiting efforts by becoming a member of RTI Premium today! Recruits should look at Tennessee right now and see a great opportunity for early playing time in a program that is building the right way. Tennessee only has four seniors that consistently play, and they’re one of the only teams in any level of college football to not have a single senior start on the offensive side of the football. In the next three to four years, a lot of young, new faces are going to be the core of a rebuild that is likely going to be successful. Recruits marvel at the opportunity to be a part of that. Prospects like offensive lineman Darnell Wright, defensive end Khris Bogle, and outside linebacker Henry To’oto’o all fill positions of need for the Vols and all three would have the opportunity to contribute right away. And those are just players that Tennessee is still pursuing. Players already committed to the Vols such as offensive lineman Wanya Morris, wide receiver Ramel Keyton, and JUCO linebacker Lakia Henry have that same opportunity. So while the score may look bad, the loss is a sign of a team that still needs to fill more spots before they can contend. There is a lot of talent on Tennessee’s roster, but there are also some glaring weaknesses. If young guys in the 2019 class can come in and fill those weak spots on the roster, Tennessee could take a big jump in year two of their rebuild. Recruits see that for what it is, and they realize that there’s an opportunity to be a part of something. 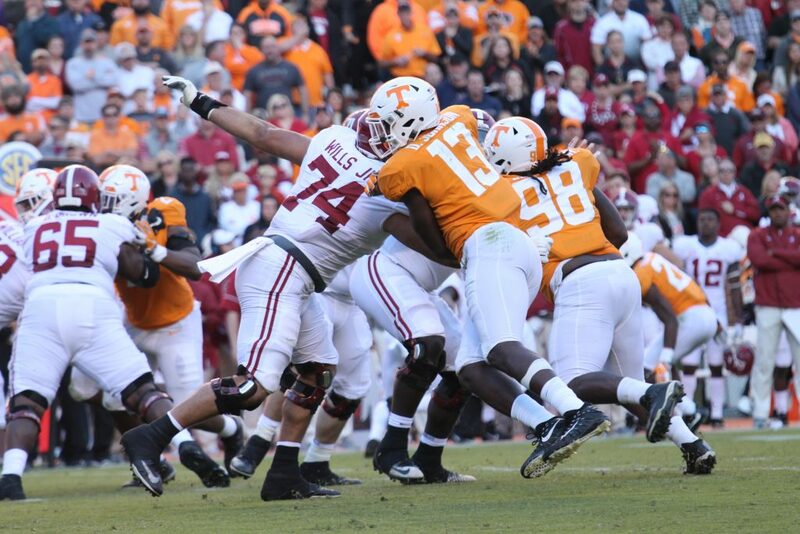 Nobody expects Tennessee to be able to beat Alabama right now, so the loss doesn’t hurt anything this year. Instead, it shows a program ready to take the next step with the right guys in place next year. Early playing time is a big deal to a lot of prospects, and after watching this weekend’s game, it’s clear that it can be a big selling point for the Vols.